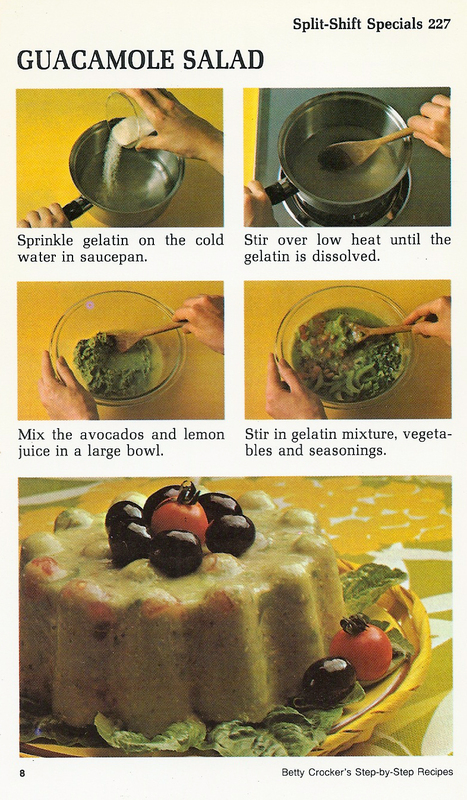 Sprinkle gelatin on 1/2 cup of the cold water in 1-quart saucepan: stir over low heat until gelatin is dissolved, about 3 minutes. Stir in remaining 1 cup cold water. Refrigerate until slightly thickened, about 40 minutes. Mix avocados and lemon juice in large bowl. Stir in gelatin mixture, celery, tomato,onions, chilies, salt and pepper sauce. Pour into 4-cup mold. Refrigerate until firm, about 3 hours. Just before serving, unmold on salad greens and garnish with olives and tomatoes. 8 servings. Timing Tip: If you want to serve at different times, Guacamole Salad will hold in refrigerator up to 24 hours. © 1975 by General Mills,Inc. All rights reserved. Printed in U.S.A.